Hang 360 is a coat rack, developed out of need for a simple and elegant solution to place your jacket, scarf and hat. 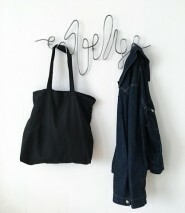 The coat rack is made from 360 centimeters of bent wire which accommodates a large number of items. Besides the servile task of wearing your favourite clothes the coat rack decorates your wall in a graceful way; perfect for your hallway, bathroom and living room. Hang 360 is made by heating a long piece of steel wire locally and bending it until it is conform to design. After the steel has cooled, the steel is re-heated locally and forged flat, to create the points of attachment. The bushings to create distance from the wall are cut to size and eroded on the lathe. Then, after all parts are sanded and varnished several times, Hang 360 is ready to take your coat. Studio TOIMII is a distinctive and dynamic industrial design studio based in Utrecht, formed by designer duo Gerben Hoogenboom and Peet de Vries. Studio TOIMII looks for realistic solutions that fit naturally with the user, developing products that simplify and enrich people’s daily lives.